This page will explain how to use the Multimedia tab on a patient's chart in TRAKnet. Multimedia is the portion of a patient's electronic record that contains all imaging files and outside records of the patient's health information. Multimedia is stored in a shared folder on a network drive, most likely on the server computer, and accessed across the office's network. Because it is not stored locally on each machine, a stable internal environment is required for multimedia access. Please speak with your IT provider if you are experiencing any issues accessing your office's multimedia files, as each office configuration is different. Multimedia is accessible in the patient's chart in TRAKnet. To access this information, first search for the patient who's files you would like to view. Open that patient, then click on the multimedia tab. The patient's multimedia will now be displayed. To scan an image to a patient's multimedia file, first click the Add Document link. This will open the below Import Document window. Image — Will only scan one page. Will save as a JPG. PDF — Will scan multiple pages. If your scanner is a document feeder scanner, it will scan all pages that are loaded into the scanner. If it is a flatbed scanner, it will scan one page, then ask the user if they would like to scan another page, dependent upon the appropriate settings under Tools > Options > Scanner. 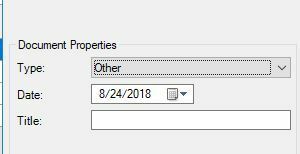 Finally, you must enter a title for your document in the title field, then click Import Document. After scanning is complete, the document will automatically save into multimedia. You can also scan to multimedia by pressing the Quick Scan button, which will take an immediate scan based off of the scanner settings in Tools, Options, Scanning and name the file after the date and time in which the file was scanned. When scanning documents into a patients mutltimedia the user has an option to select the scanning properties for that document. These include the document type, date, and Title(a title is required for all documents). The document type will determine how that document is used in the TRAKnet application. Imaging — The imaging option allows the user to associate the scanned or imported file to an existing Radiology order. Patient Generated Document — This option designates this as a patient generated document for use in the completion the Advancing Care Program measure "Patient Generated Health Data"
Other — The other document type is used for all other documents. A document can be scanned into the multimedia with as little as one click with the Quick Scan button. The Quick Scan uses the settings set in Scanning Options, meaning that if Use Scanner Driver Interface is set to True, the scanner window will pop up and prompt one more click to actually scan. To upload an existing file to your multimedia, click the Add Document link, then select Upload File. This will create a Browse File icon, allowing you to open Windows Explorer to select a file already saved to your computer. Once you have selected your desired file, click Import Document.